Digging Jim is an original interpretation of Boulder Dash. The way in which the creators conceived of the old Boulder Dash principle is just outstanding. They managed to produce a modern remake of the old classic, without loosing the plain but attractive atmosphere of it. This game is not a remake in the sense of transposing the old game with its original levels in an accurate way into a modern adaption, but a whole new game idea. Yet, it somehow reminds me of the original Boulder Dash, which made so many fans across the world. For that reason, I think that you won't be disappointed when playing Digging Jim. In this game you go with a creature called 'Jim' into the subterranean caves of his home planet Akturien. Jim is a queer being in the way of his appearance (big eyes, uncombed hair etc. ), which looks quite funny. The levels are enjoyable, as they are neither too simple, nor too hard. 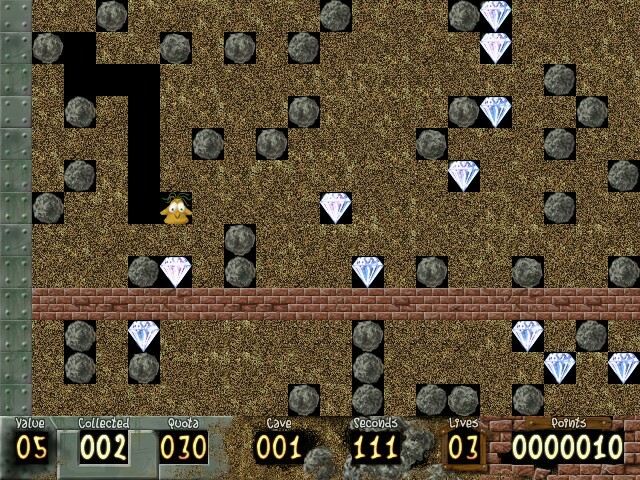 Besides the classic Boulder Dash elements (boulders, diamonds, normal and magic walls, amoebas, etc. ), it contains some more game elements, such as growing walls and bombs. And the butterflies have been replaced by evil looking monsters. The graphics, music and sounds are good. The scrolling and movements are very smooth and the graphics quality is high. In the main menu you can hear the cheerful soundtrack, but the levels themselves don't have background music (they only have sounds). That is a good thing, because it gives the game a tranquil and restful atmosphere. Most sounds are in 16 bit stereo, which means that they are of quite a good quality. A nice extra feature is the level editor, which comes with the game. With this editor you can create your own levels and share them with others! Below you can find such levelsets which have been created by players. Because Digging Jim is a commercial game, some features are locked in the game and the editor. And you can only play twenty levels in the shareware version. In the full version, all the features are unlocked and you can play all hundred levels. With the registration you get a unique code with which you can change the shareware version into the full version. Although the game is English, there is a French manual instead of the standard English version available. It has been created by Philippe Le Roux. Download it here. The authors of this game are Peter Praest (programming and soundtrack), Robert Kjettrup (graphics) and Henrik Sundberg (soundtrack) of Persei Entertainment, a Danish computer games company. The system requirements are: A Pentium 90 Mhz or better, 16 MB RAM, DirectX 3.0+ and Windows 95/98/ME/NT4/2000/XP as operating system. Dons Caves 9 Linda Decker Nine very sweet levels. ('Dons' is the Dutch word for 'Fluff'). Forever 10 Arnold Smith With plenty of extra lives. GeoMetry 4 Curtis Four rather pointless caves. Possible Caves 15 Valentin Grohar An interesting set of small caves. Spooky v1.4 3 Paal Olstad Also known as 'Digging Jim's adventures in the spooky underground city'. For experienced players. The Great Escape v1.0 21 Per Bellfield According to the author, this levelset will be extended and is therefore called 'v1.0'. There are some cheat codes for this game. Press F12 anywhere in the game to select every cave in the main menu and to unlock the function to skip a level while playing by pressing the F1 key. Below you can find the external links to pages about Digging Jim. Persei Entertainment Official Website The official website of Persei Entertainment, the company that developed Digging Jim. Digging Jim - Paal Olstad A page by Paal Olstad about Digging Jim.